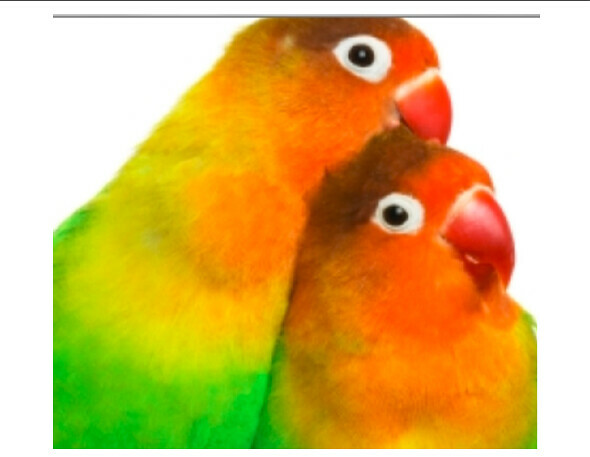 LOVEBIRDS - What Does it Take to Care For These Special Pet Birds? You’ve probably seen these gorgeous birds in your local pet store. They are the miniature green parrots with the big expressive eyes. Love Birds are a good choice for someone who wants a parrot but doesn’t want the commitment that a large parrot requires. A large parrot such as a Macaw can live for 60 or more years, while a Love Bird seldom lives more than 15 years. Before you go out to buy a Lovebird, you should be aware of what you’re getting into. Lovebirds, like all parrots, are relatively high maintenance pets and therefore require a dedicated and special type of pet owner. Here are some important factors to keep in mind. Love Birds, like all parrots, are extremely social creatures and crave the company of others. If you don’t have a few hours to spend with him every day, then you’ll need to buy another lovebird to keep him company. Without the companionship of humans or another bird, your bird is likely to exhibit problem behavior such as extreme aggression, excessive preening, and constant squawking. Peach Face - This species is usually green, with a peach head, face, and neck. Fischer’s Lovebird - This bird has a green body with shades of yellow and orange on their head and neck. Masked Lovebird - This bird has a green body, with a dark brown colored brown mask around their face and neck. Just below this mask is a yellow band of feathers. Lovebirds require a large cage with plenty of room to stretch out their wings and play — obviously, a pair will require a larger cage than a single bird. The majority of the cage bars should be horizontal and there need to be a few perches located at varying levels. Place plenty of toys in their cage to keep them stimulated. Love Birds require daily exercise to keep them healthy. This means you should let them out to fly every day in a safe room. Make sure there are no open windows or predators (such as dogs or cats) in this room. You should feed your lovebird a quality parrot seed mix and plenty of fresh, clean fruits and vegetables that are bird–safe. This will give them a good variety that matches what they might find in the wild. You’ll need to remove any uneaten food every day.